Hyrule can be a perilously hot place. Learn how to keep Link cool. The Legend of Zelda: Breath of the Wild offers a vast, open environment that often presents danger in the form of extreme climates. Players stumbling into the Gerudo Desert will not only find Link shuddering in the cold at night, but struggling to stay cool during the day. On Death Mountain, players run the risk of actually spontaneously combusting without the right thermal protection. Don't worry, though, we're here to show you how to best protect the titular Hero from the world's hottest areas. Players will likely first come across the Gerudo Desert on their way to deal with the Divine Beast Vah Rudania. The area alternates between extreme hot during the day and extreme cool by night. Smart players will likely have already picked up the Warm Doublet from atop Mount Hylia, but will likely not yet have found a way to fend off the desert's tremendous heat. Fortunately there is an item found within the Gerudo Desert that can alleviate the symptoms of overheating. It's called the Hydromelon, and it grows in patches all across the desert floor. Alternatively, players can pick up Hydromelon along the path to Gerudo Town at the Kara Kara Bazaar. Once cooked, be it individually or with other food items, the Hydromelon provides the critical heat resistance buff players will need to cross the desert. Tasty as those melons might be, though, some players will likely prefer a more permanent solution to the cooling problem. 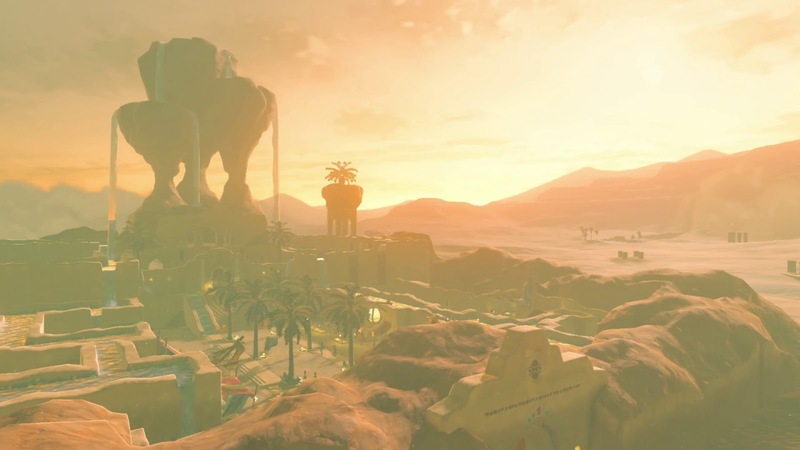 No problem: during the game's main questline, players will have to sneak into Gerudo Town, a place that's notoriously opposed to the likes of men. During the quest to defeat Vah Naboris, players will stumble into an NPC running a shop at the top of Kara Kara Bazaar, who, for a set number of rupees, will part with his Gerudo Veil, Gerudo Top, and Gerudoo Sirwal. The individual pieces of the set don't provide individual bonuses, but all together, they provide a solid low-level heat resistance perfect for crossing through the desert. Players will need to cross Death Mountain to get to Goron City in their quest to deal with Vah Rudania, and it will become immediately apparent that they're ill-equipped for the mountain's scorching heat — even with the Gerudo costume, Link is still likely to simply burst into flames. Sure, skilled cooks can find all the necessary ingredients to concoct a Fireproof Potion, but that requires much time and effort, so for many, buying potions is the easier option. There exists a place near the Foothill Stable, a short ride west of Cephla Lake in the Eldin Region, where players might procure a heat-warding beverage. There they will find an NPC named Gaile who offers Fireproof Potions: one for 60 rupees, two for 110, and three potions for 150 rupees. Go for the 150 rupee option, as finding a more permanent solution to the heat problem requires climbing a considerable distance up the mountain. After gulping down a Fireproof Potion, climb Death Mountain until the Hero reaches an area called the Southern Mines. Inside the mines, an NPC named Kima will trade 10 Fireproof Lizards for a piece of armor that will permanently increase the Flame Guard stat. If players haven't been collecting Fireproof Lizards so far, no worries: they're abundant within the Southern Mines themselves. Once ten of the little critters have been acquired, players will be treated to the Flamebreaker Armor, a slick-looking piece of work makes the Hero fireproof no matter whether one piece or all pieces of the set are being worn.